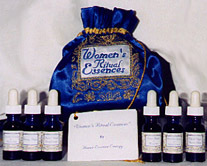 Kit includes eight 1/2-ounce essences. Use these essences to relieve pain, emotional or physical. Place them on the Chakras, awareness points, or with acupressure or acupuncture. Use them for emotional clearing or in your environment. Create a ritual, or use them in the bath. Combine one drop with sage, cedar or lemongrass. Place a few drops in a bottle of water and spray the room. If you have alcohol sensitivity you can apply these essences to the pulse points (wrist and neck) and the essence will be absorbed. project, becoming clear on the intended outcome, this will awaken your inner wisdom. Created at Sunrise of the October full moon, on the edge of the ancient volcano Haleakala on the Island of Maui, Hawaii. spring where the Oracle of Delphi purified herself before entering the temple. Cup the water in your hands and as you allow the water to flow over your head and body say aloud: With these waters I am purified, cleansed and made new. of INITIATION under your tongue or in a glass of water which you drink, ring a bell or sound a chime as you face each direction and call in the Great Teachers. Invite them into your heart and receive the I Am presence. EARTH WISDOM on the top of your head. Feel the light, joyous energy flow, enliven every cell connecting you with earth. Listen to the wisdom expressed in the birds, trees, plants, the creatures seen and unseen. sustenance from Mother Earth. Allow the tree s strength to become your strength. things that you are thankful for at this time. Take your notebook and list all of the things for which you are grateful. Place this list where it is easily read. Or write each gratitude on a post-it note and place on a long string, like prayer flags to hang on your bathroom mirror. For one week every night before sleep take 3-5 drops of ACCEPTANCE, reread your gratitude list in your notebook and add the new things for which you are grateful. renewal into your life. Take 5 drops of WHOLENESS before you go to bed at night with the intention that your dreams will invoke your answers. Before getting out of bed immediately when you wake up, write the first thoughts of your dreamsyour answersin your notebook, just as they did in the Healing Temples of Asclepios in ancient Greece. your choice. After your bath, light a candle and put 3 drops of CREATION in a glass of water. As you sip the water take your notebook in hand and allow the inspiration of the Fertility Goddess to manifest your desires.